In honor of Halloween all posts from now until October 31st will be horror films of one kind or another. 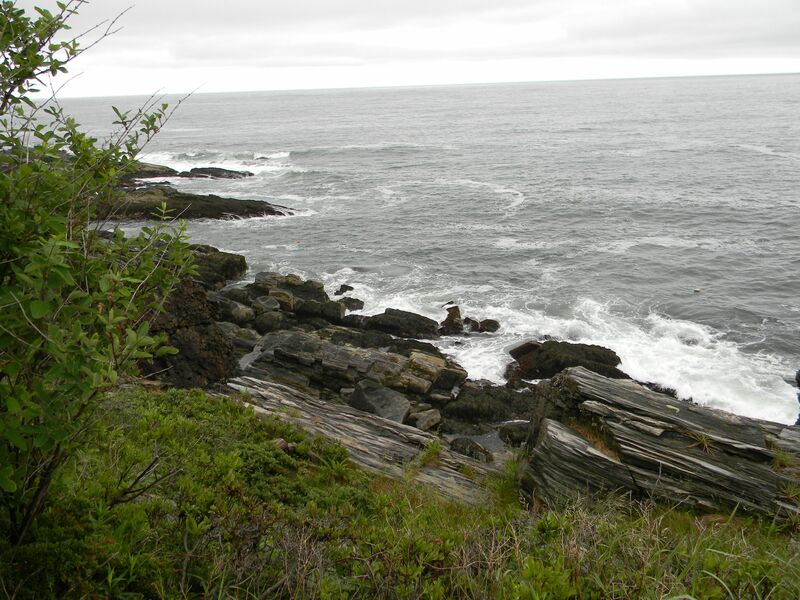 One of the reasons I chose New England as my adoptive homeland rather than staying in the Midwest is some of my favorite books and movies take place here. One of my all time favorite books and movie adaptations is The Visitors (1965, by Nathaniel Benchley, papa to Jaws author Peter). 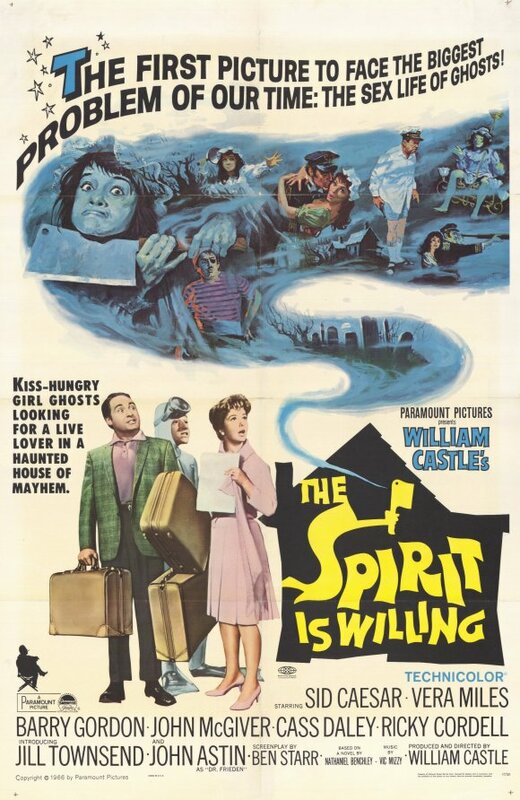 The subsequent movie, The Spirit is Willing (1967) is a great version of the book. Set in Northern New England in the 1960s, the story starts with a middle class mom, dad and teenage son leaving New York City for some much needed R&R. The father has had a nervous breakdown and so they head up coast looking for respite. The family settles on a broke-down old coastal Captain’s house to live out the summer and re-group. The house turns out to be haunted by thee very strong ghosts who torment, flirt, and cause ill to the family. The husband is the sensitive-type and the wife is a realist. This difference in personalities is the life lesson of the story. Sid Caesar plays the husband in the movie and Vera Miles play the pragmatic wife. The son is played by Barry Gordon. The famed horror exploitation director William Castle helmed the movie. It was my friend Caroline who first discovered the novel the summer I turned twelve. She and I share many passions – the lure of small coastal communities, ghosts, and mysteries are but three. The book had all three! Later that summer we were watching late night TV when we came upon a movie titled The Spirit is Willing that seemed so similar in description to our new favorite book we decided to watch it. It was the film version of The Visitors! This was way before the internet so we had no idea that a movie had been made based on our favorite book. All the next day we talked about it. We went over every scene and compared it to the book. And then later that night we turned on the TV and it was about to begin – again! Magical stuff for a pair of twelve year-old’s. We never saw the movie again. About ten years ago my friend John ordered an out of print copy of the novel. To this day, Caroline and I trade it back and forth. She also found the whole movie on You-tube recently. But you have to watch it in ten minute installations and the copy is terrible. This story changed my life. I moved to Portland, Maine (my home still) partly as a result of loving the book and movie so much. 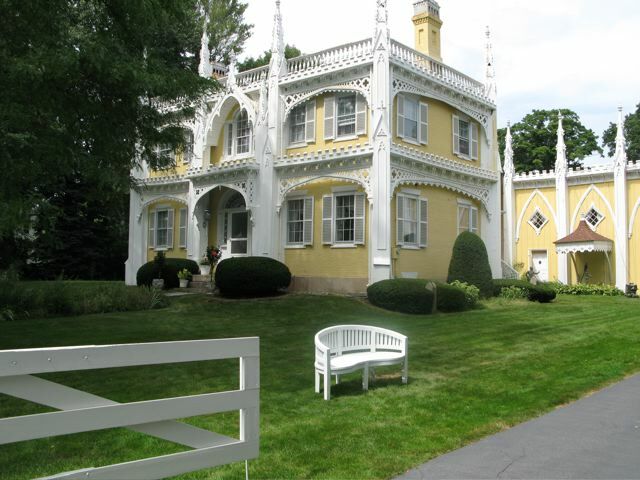 It was a real treat for me after I first moved here and visited the other coastal towns like Bath and Bar Harbor and saw the huge mansard roofed or elegant Victorian buildings of the long dead Captains and saw the beautiful and sometimes outlandish embellishments on the houses. And, I know why coastal Captain houses included those seemingly crazy embellishments from Nathaniel Benchley in The Visitors: when the Captains were land-bound they grew bored not steering a ship or watching for storms or the other scary stuff Captains do at sea. To occupy their time on land they made intricate moldings and facades and cornice pieces and attached them to their home. The Visitors also taught me that to hold on to beliefs at the detriment of sanity can be a losing battle. Sometimes you have to bend so as not to break. In the story you think it will be the husband who goes crazy over the ghostly sightings given his recent break down. But he becomes an amateur detective, going to the local library and researching ghosts and talking to locals to find out more information (this is a great technique in suspense/horror movies – What Lies Beneath, 2000 and Rosemary’s Baby, 1968). The husband is validated by his inquiries – everyone thinks the house is haunted for various reasons and he can accept the ghosts: the vindictive Felicity, the flirty Jenny, and the malevolent Ebenezer. The wife, on the other hand, does not believe in ghosts – so, ghosts can’t exist even when they do. So, no matter how much evidence is put forth to the contrary she cannot accept it. She can not accept what is in front of her and as a result she is driven insane (this is a gentle story so the insanity only lasts for a short time). The husband is empowered by his beliefs and his new found pro-activeness regarding the ghosties and he is triumphant. He is a brave man, after all, and can return to NYC and be a man’s man in the mid-1960s again. If you ever see this movie on cable please, please, please watch it! And if you love New England stories check out Nathaniel Benchley. He wrote about class and Islanders vs. Off-Islanders, and a whole host of observations of Yankee living. This entry was posted in boots1965 posts. Bookmark the permalink. Hi Betty! You are correct; the Youtube version is a very crude copy, but I love the comic interaction between Sid Caesar and the actor who plays the kid. I am so glad you watched it! Yes, their timing is perfect. The movie is a fun combination between funny and scary -more funny. And the book is truly creepy at times.